1. What are the methods in controller? ProcessRequest : is called when the page is requested for the first time from the server i.e when the page gets loaded for the first time. ProcessformData(not visible). : Used to capture Data from the form fields which the user has entered and post it into Model Layer. 2. What is Extension In OAF? The process of adding some more functionality to and existing OAF component(Page, region) without affecting its Vanila functionality is known as Extension. 3. What is personalization in OAF? 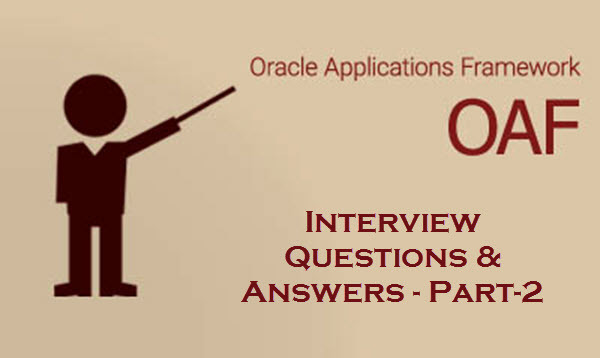 Oracle Apps Framework has an OA Personalization Framework associated with it so that you can personalize any OAF page in an Oracle E-business Suite application without changing the basic or underlying code of that OA Framework page. Oracle Application Framework makes it very easy to personalize the appearance of the page or even the personalization of data displayed on an OA Framework page. 4. What are levels of personalization? 5. what is a Javabean? 6. What is query Bean? 7. What is the difference between auto-customization search criteria and result based search? 10. What is the difference between customization and extension?